Star brite® Ultimate Fabric Guard helps extend maximum service life of all outdoor fabrics. Polymer formula restores water repellency to older fabrics and protects new fabrics by creating a barrier against moisture, stains, and damaging UV exposure. Clean surface to be treated with Star brite® Ultimate Fabric Clean as Step 1. Fabric must be clean and dry. 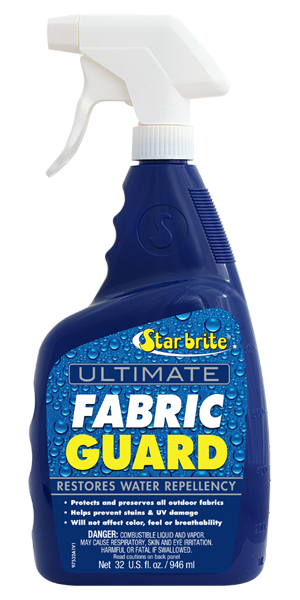 Apply Star brite® Ultimate Fabric Guard by thoroughly wetting the top side of the surface. Avoid/wipe off overspray or drips from surfaces not being treated. Allow treated fabric to dry for 6 hours before use. Do not fold or store treated fabric until it is completely dry.